My friend's little one's first birthday was just the reason I needed to make this delight. 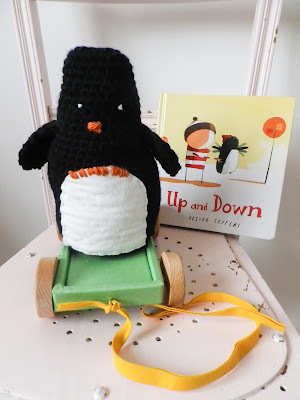 Not sure now when, or where, I came across this pattern for the Up and Down penguin by Emma-Jayne Fakes but I was itching to make my own. Well, Leo's own. This version has a slightly more elongated head than the original which is totally my fault - I should have paid more attention! He was made using some unknown black wool from the basket but I do think it was thicker than the DK used in the original pattern, and so he simply needed less rounds for his head. Oh well, by the time Leo has cuddled him and sat on him a few times, I'm sure no-one will notice. The wheeled base is part of a toy I bought in the M&S sale a few years ago, for this very purpose. Do hope you are having fun being one, Leo! Hope I'm not putting you off leaving your lovely comments with my manic replying this morn! I shall hopefully return to a much slower pace. Much slower, with my sporadic posts! Did I really just knit a minecraft hat?